Mori Lee wedding dresses have always been a favorite among brides because of the trend setting styles they carry at affordable prices! Madeline Gardner is the brainchild behind the designs of Mori Lee. To make it easier for a bride to select a bridal dress, Mori Lee wedding gowns are divided up into 4 collections. Their Bridal Collection Line features their traditional wedding gown line. You will find a-line silhouettes in narrow and wide skirt widths and the full ball gown styles which all are made in the traditional fabrics. "The dress pictured below is great for the curvy hourglass body shape. But if you have a rectangular body shape you can pull this off with the right body shaping garment." The Blu Collection has more romantic and unique wedding gown styles. You will see more pick up style skirts and fit and flare styles like the trumpet and mermaid styles. You will see simpler fabrics and less beading on these gowns. The Voyage Collection are of informal wedding dresses. These are romantic styles and are less frill than the other lines, but no less gorgeous. Most gowns that are destination or beach wedding gowns are usually a narrow a-line styling, but not so with Mori Lee bridal gowns. They have tiered, and some full styles, pick-up and straight styles among their informal bridal gown line. "Take a look at this Grecian look below! If you are a mature bride, this gown is figure flattering, hiding the stomach area and it is not strapless.. It also cinches in right under the bust which is the narrowest point for those who have an apple body shape. And the body skimming, flowing chiffon fabric is always figure flattering." Angelina Faccenda Collection are gowns of the highest quality fabrics, lace and embroidery details. Elegance and class is what this line represents. "This dress is style at it's best! The trendy one shoulder wedding dress has a ruched bodice, paired with a fit and flare trumpet skirt, has all the makings for a bride who wants to make a statement! This dress will show off all your hard work if you have been working out. So if you have that hourglass figure, this is the gown for you!" 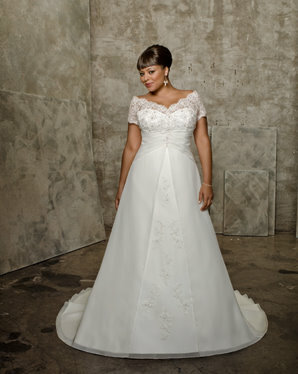 The Juliette Collection are the plus size wedding dress line. These gowns are designed to flatter the plus size bride. The silhouettes, fabrics and details make Mori Lee wedding dresses standout in design for plus size women. You must check out their figure flattering styles! "This gown below has been a favorite among brides for a few seasons now! You can see why! It is very figure flattering for the pear shaped, prominent bust, apple shape, and rectangle shaped bride. And it is one of the few off the shoulder gowns that have sleeves." Mori Lee has much more to offer! To see more Mori Lee wedding dresses go to their website. When it comes to shopping for Mori Lee bridal gowns... you can check your local wedding dress shops to see who carries their line. The Mori Lee website has a search tool you can use to locate a retailer near you. If you are the type who likes to shop online for wedding gowns, make sure you only buy your gown from an online wedding shop that is authorized to sell authentic Mori Lee wedding dresses. Usually you are safer if you choose an online bridal shops that are located domestically and not offshore. This way you will be dissappointed by ordering a copycat design that doesn't measure up to the designers standards. If you need an online shopping source... take a look at the shop below or go to Madame Bridal. Madame Bridal is an affiliate store of this site which sell designer gowns at a discount. They sell authentic designer gowns and are an authorize dealer for the designer lines they carry.